The 90’s saw an incredible decade for footwear design, giving birth to some of the most iconic runners and basketball shoes of all time. 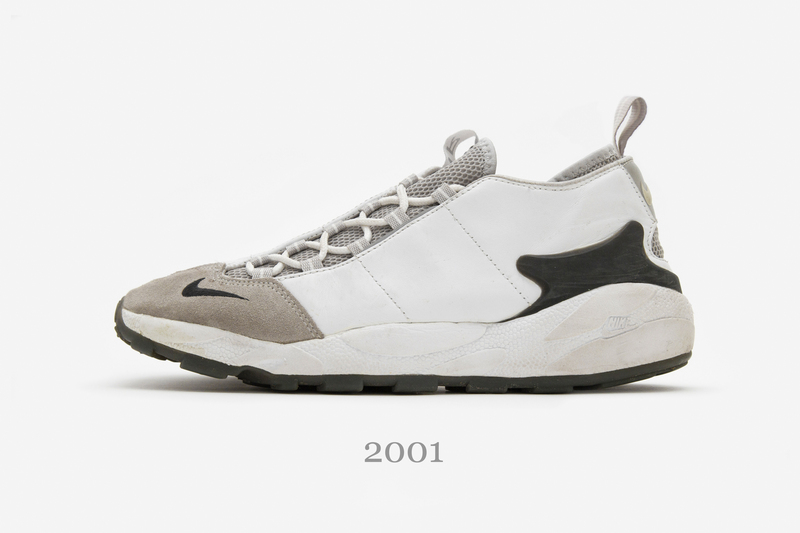 Nike also dabbled in creating innovative footwear that didn’t necessarily hold face value beauty as its number one priority, but the technical aspects were spot on. 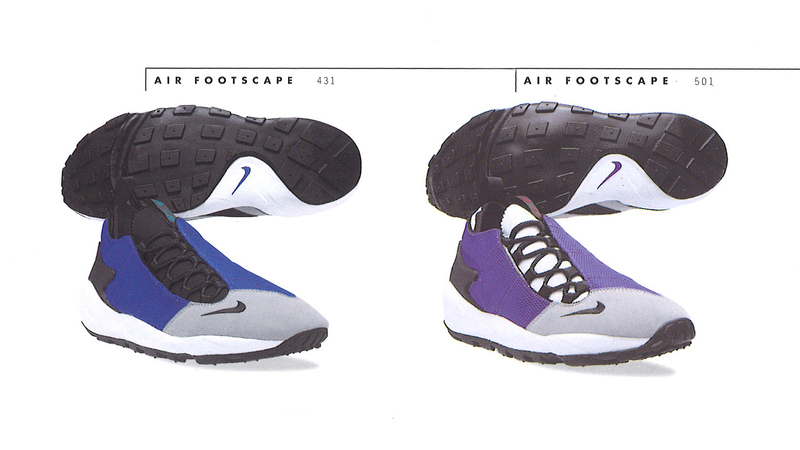 The Air Footscape is one of these creations built out of purpose, in an experimental move to improve comfort for the wearer in an area other than underfoot. Developed in Nike’s esteemed Sports Research Lab with the Advanced Product Engineering group, the project is famously credited to footwear designer and engineer Toren Orzeck (also responsible for the Air Moc, and developing Nike Foamposite technology). 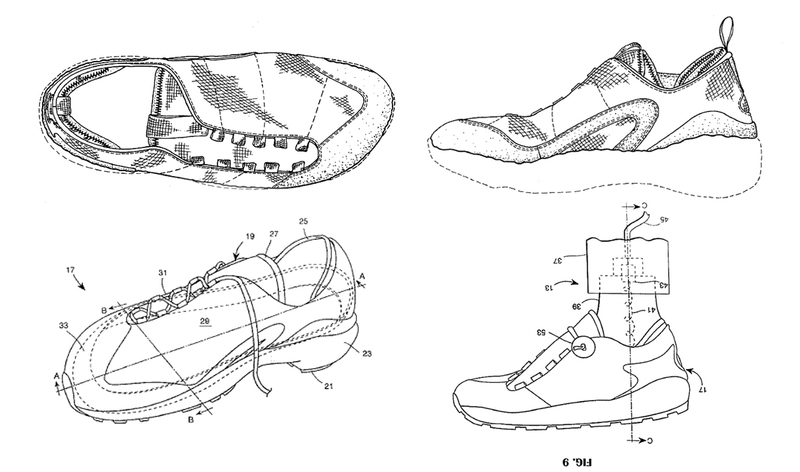 Among many of his other experimental ideas, Toren proposed the idea of creating a ‘Footform’ shoe that was correctly built around anatomical shape of the foot. Several different men’s and women’s feet were cast to get an idea of an overall shape, and the upper was then designed to give that perfect ‘form-fitting’ structure. The asymmetric lacing system was implemented to help relieve stress from the dorsal area of the foot where key arteries and nerves are situated, which can often become restricted when the shoe is laced up. Orzeck sights he took inspiration from the way in which orthopaedic shoes are often constructed to ensure the best comfort for the wearer. Suede and mesh were the core materials used on the original 1996 version, and a plastic heelcup added extra strength to the upper around the rear. The lightweight Phylon midsole (also later used in the Mayfly and Presto a few years further down the line) was also an innovative mould designed for comfort, and has carried the Footscape’s DNA into the future even if the eccentric upper hasn’t been present. 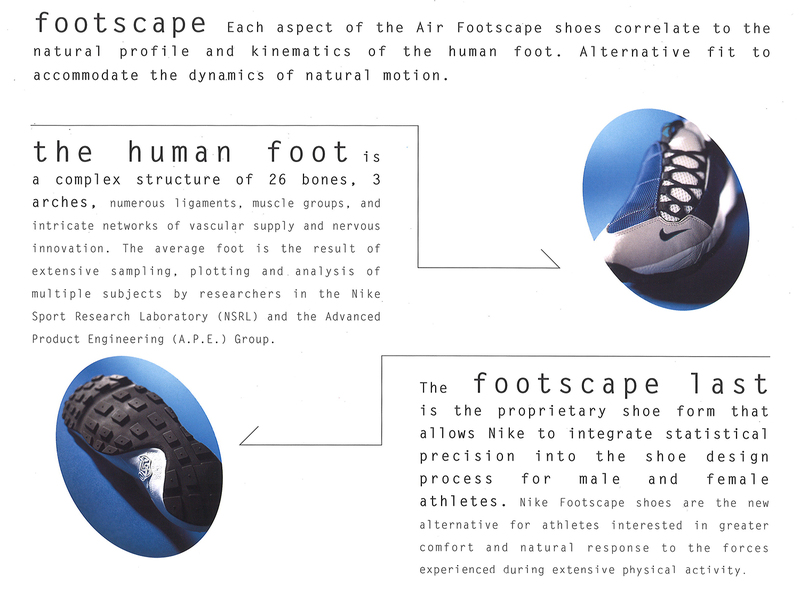 Footscapes have become a cult favourite among Japanese collectors, largely down to it’s unique shape over anything else. The footwear last used to shape the Footscape is slightly wider than a normal fit, which suit’s the foot of the Japanese consumer perfectly. Furthermore, endorsement by Tokyo’s godfather of streetwear Hiroshi Fujiwara (Fragment Design, HTM) during it’s early years of release confirmed just how incredible the Footscape was, soon finding a spiritual home of it’s own in the far east. 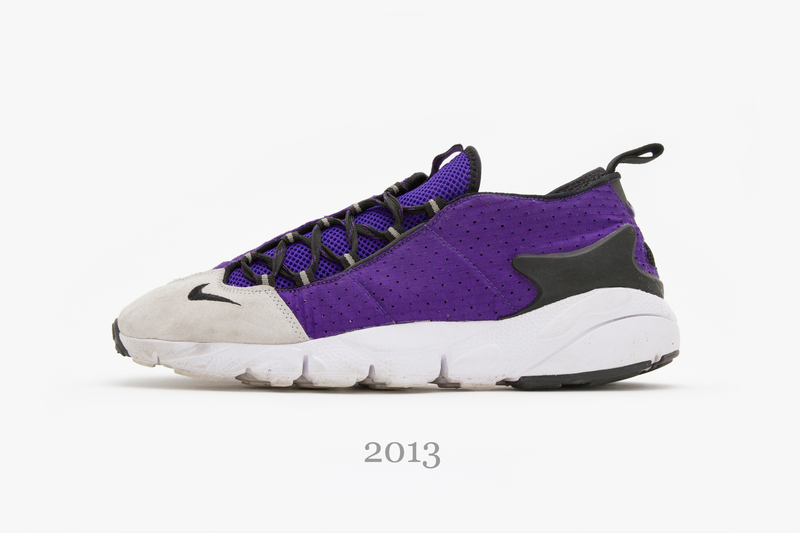 Over it’s twenty year lifespan, the core Footscape shape has undergone numerous reinventions. Amalgamations with the Air Woven, added Flywire support, changes to upper construction and numerous collaborations with artists and brands such as Fragment, Clot, F.C.R.B and The Hideout have demonstrated just how Toren’s obscure vision can be reinterpreted again and again. These projects have consistently tested the shoes design integrity, and it continues to pass with flying colours. 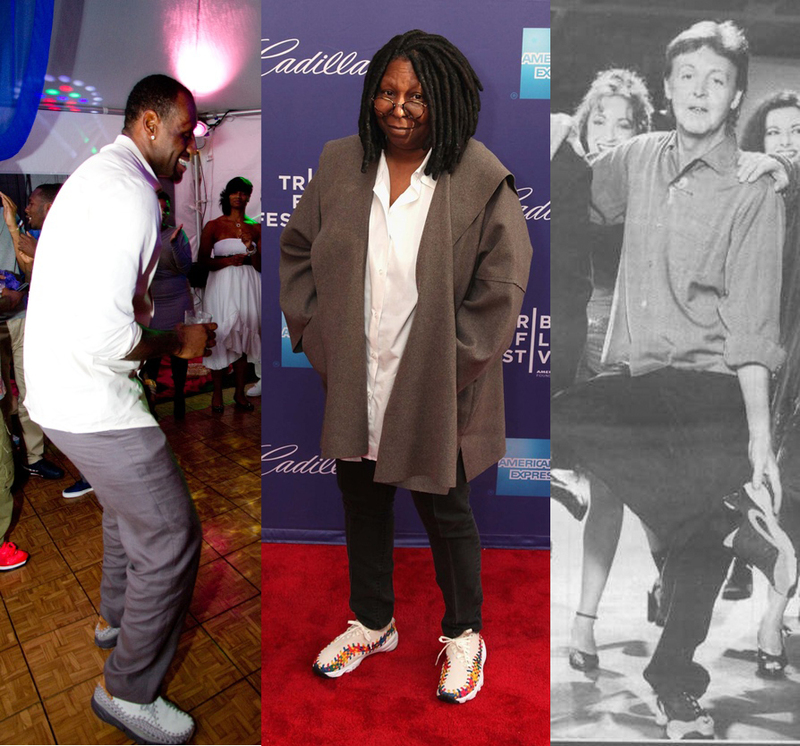 If that wasn’t proof enough just how good it is, Lebron James, Whoopi Goldberg, and even Sir Paul McCartney have all been spotted with pairs on foot! 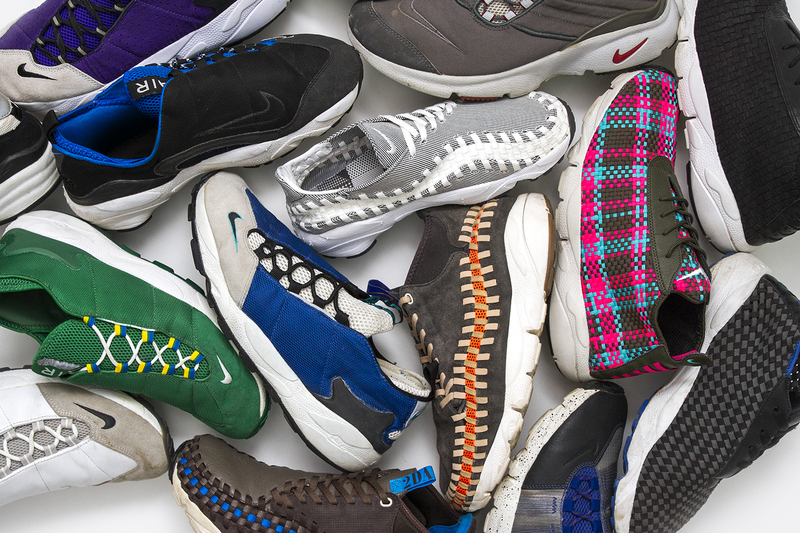 Surrounding the recent release of the Footscape Motion and soon to arrive Footscape Woven Chukka, we’ve delved into the personal collections of some of our HQ staff and tried to pull together as many different variations of the Footscape as possible to showcase it’s versatility. From an original pair from 1996 all the way up to present day with the recent football inspired Magista update. Enjoy the obscurity. One of the most famous original colourways associated with the Air Footscape is the Varsity Royal/Zen Grey option. 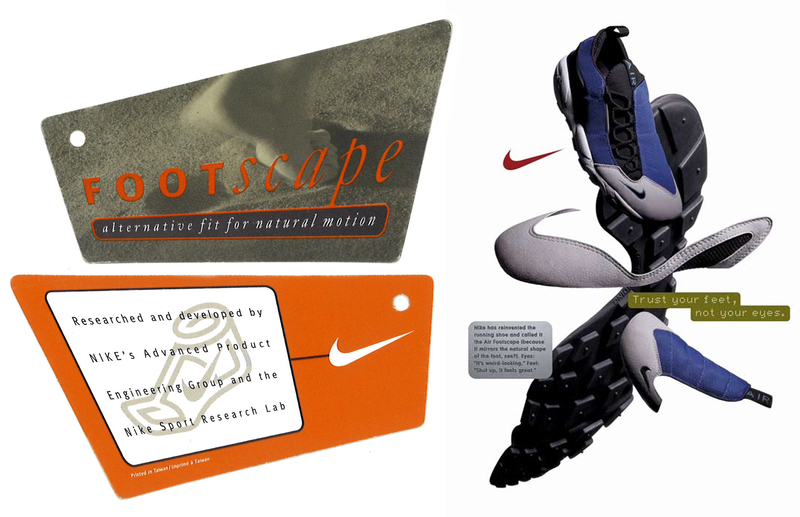 Original sales samples of the shoe pictured in 1996 Nike catalogues and even in the print advert (featured further above) featured a black neoprene applied to the interior elasticated tongue, and a swoosh in place of the extruded Footscape logo on the instep. The release version however came in an off-white flexible mesh instead which balanced out nicely with the white midsole. 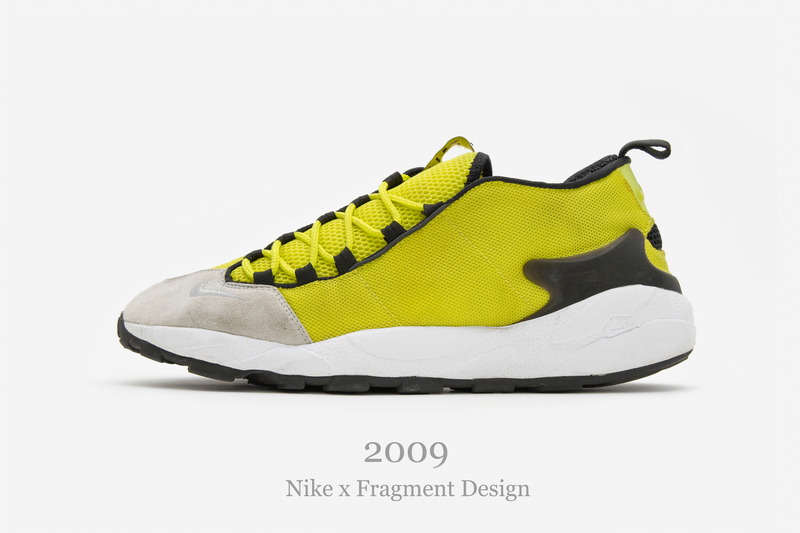 It’s not known how many of these versions are thought to still be out there, and alongside the yellow prototype it’s become one of the most sought after among Footscape fiends. 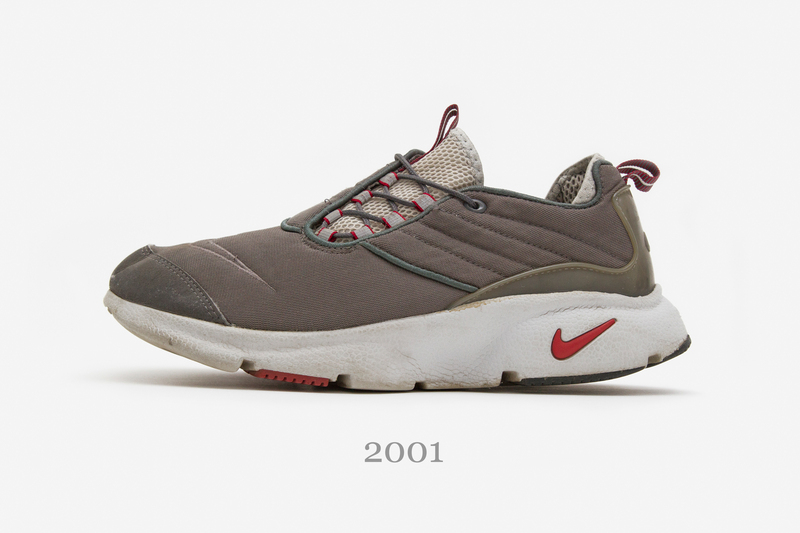 Alongside the original shape, the asymmetric lacing system also lent it’s aesthetic to a host of other shoes in other categories including Dennis Rodmans Air Shake NDSTRUKT, but running was always it’s true home. The Stasis (although not designed by Toren Orzeck) used the same material combination as it’s sibling, with the addition of a chenille swoosh on the lateral side in place of the mini swoosh on the original style. In contrast to it’s standard make-up of suede and mesh, a hardwearing leather was applied to the upper which added a slightly more premium look to the Footscape in comparision to it’s original ‘sport-ready’ feel. 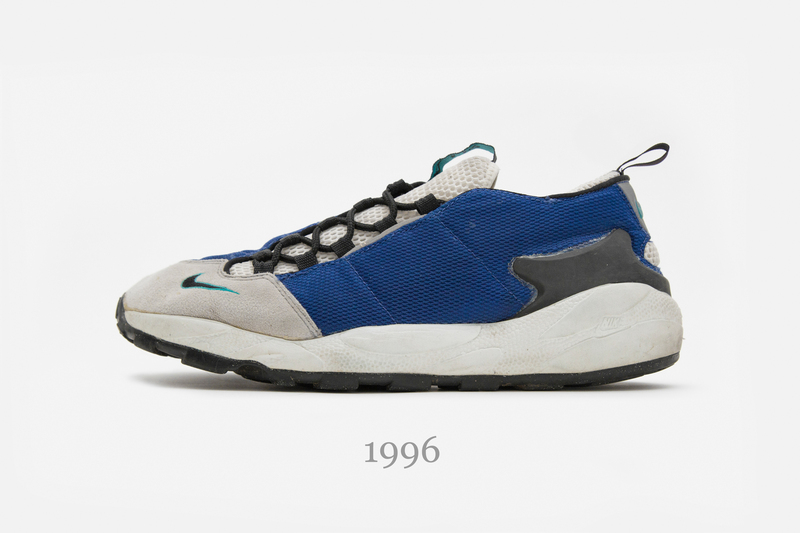 An amalgamation of two eccentric silhouettes, 2001 saw a merging of the Footscape with the innovative ‘T-shirt for your Feet’. Key elements of the upper and heel cage from the Presto were reimagined, and sat alongside the obscure side-lacing system and a brand new midsole unit that took design ideals from both worlds. A further enhancement of the Leather version from the same year, reptile print was added to the entirety of the upper (including the predominantly suede-kept toebox). This application alongside olive green hits on the swoosh branding and lace loops gave the beast it’s nickname. 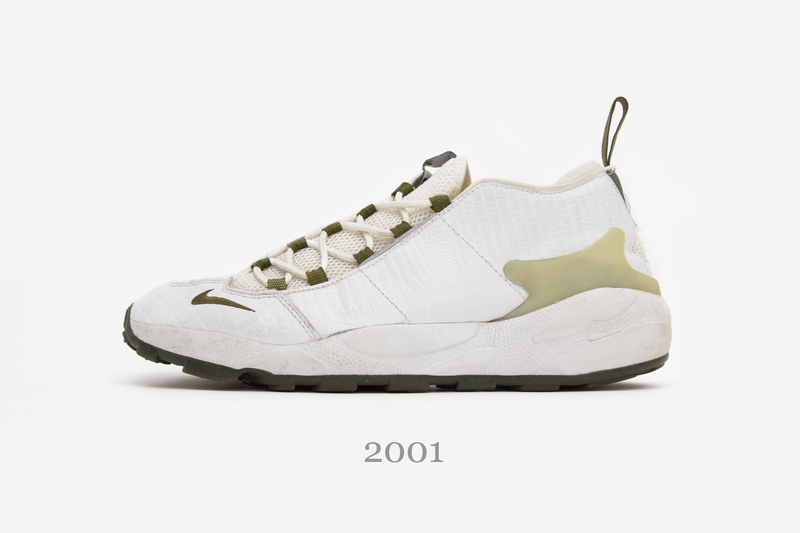 First introduced to the world via Nike’s HTM initiative in three colourways in 2005, the mid-cut boot took a construction method from 2000’s innovative Air Woven and applied it to the same midsole unit from the original Footscape style. 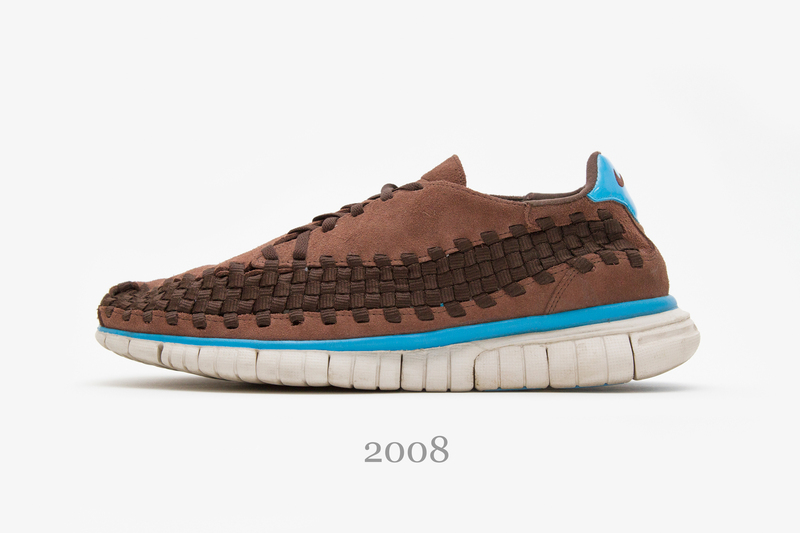 A worldwide release followed in 2006 and since then even this style itself has evolved significantly. 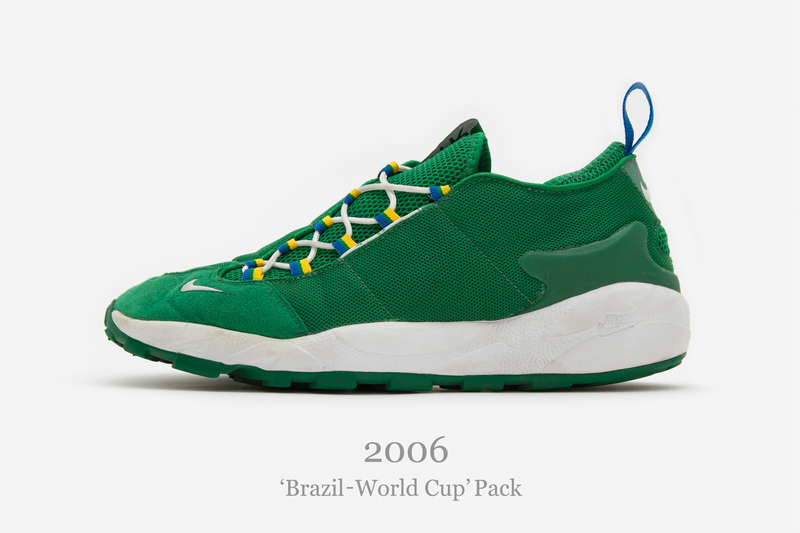 Released in a pack of three in celebration of the 2006 World Cup in Germany, a Brazil specific Footscape pack took colour cue’s from the countries national flag to inform it’s palette. With design details dotted throughout (on this pair note the tri-coloured lace loops) the blue variation was decorated with 27 embroidered stars, as seen on the flag, which represented each state in Brazil as well as the federal district. 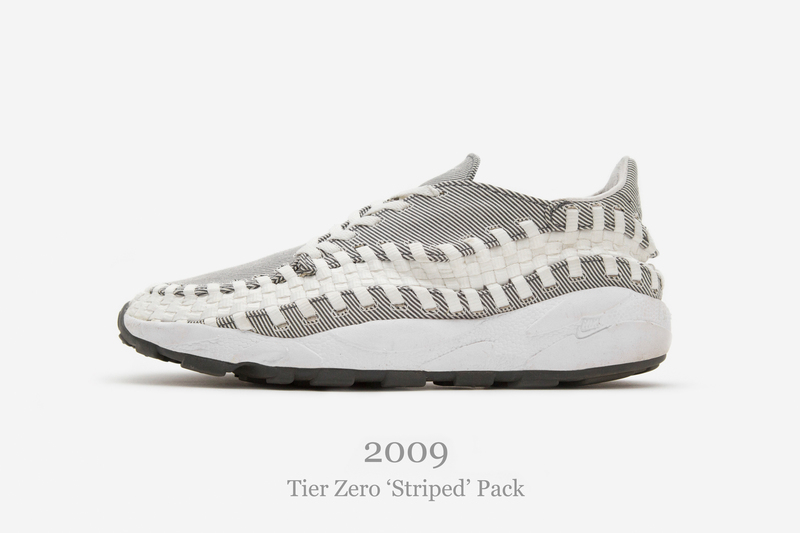 Also released alongside this pack, a collection of Footscape Woven’s were released which represented several other countries competing in the competition. Another coming together of several different shoes, this iteration collided elements from 2005’s HTM Footscape Woven, and Nike’s Free cushioning program. In this instance, Free 5.0 allowed for enhanced flexibility across the midsole unit to improve comfort. A taste of things to come in the future perhaps? Presented alongside an Air Max 1, Air Footscape and the rather obscure Pocketknife, the woven rendition featured an all over monochrome pinstripe material, with a clean white weave running throughout the upper. 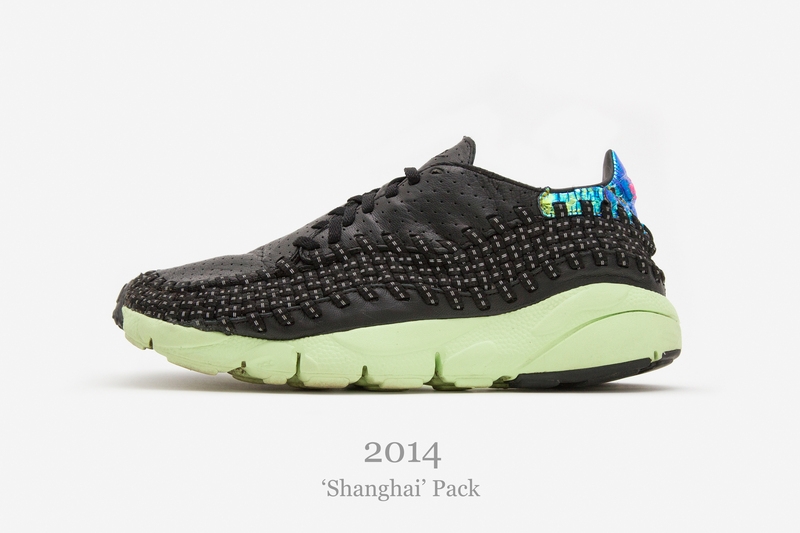 Released at Tier Zero level, it was only available at very select locations around the globe (the precursor category to the Nikelab product of the modern day). 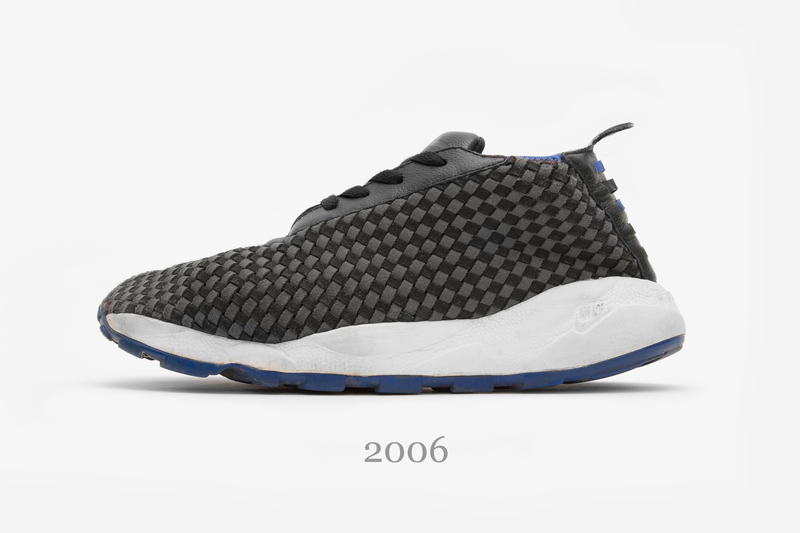 This is also probably noted as being one of the last renditions of the Footscape Woven to feature the original sole unit before it switched over to Motion. 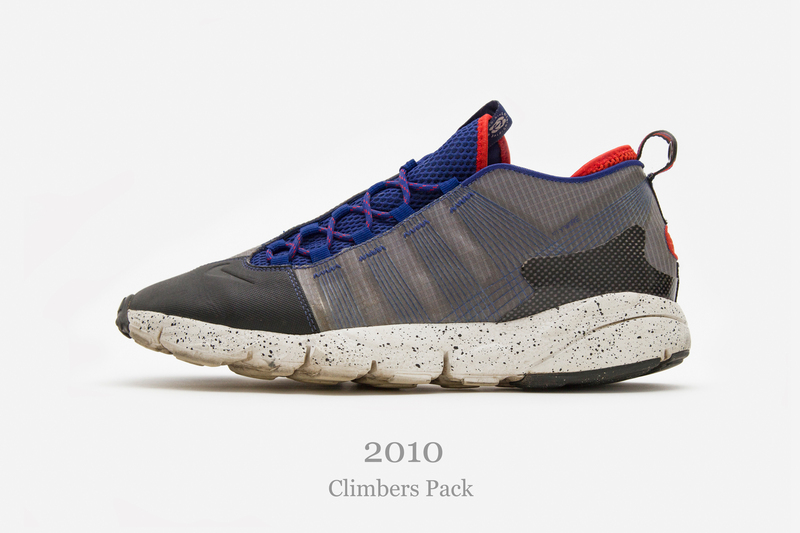 Hiroshi Fujiwara has always been a champion of the Footscape since it’s creation, having made his mark on several versions in the years previous to this release. A pack of four shoes created under his Fragment Design brand were created to pay homage to the original, complete with block colour mesh uppers and the token grey suede toe. Fragment’s logo was subtly added onto the heel pull tab to not disrupt the rest of the classic aesthetic. 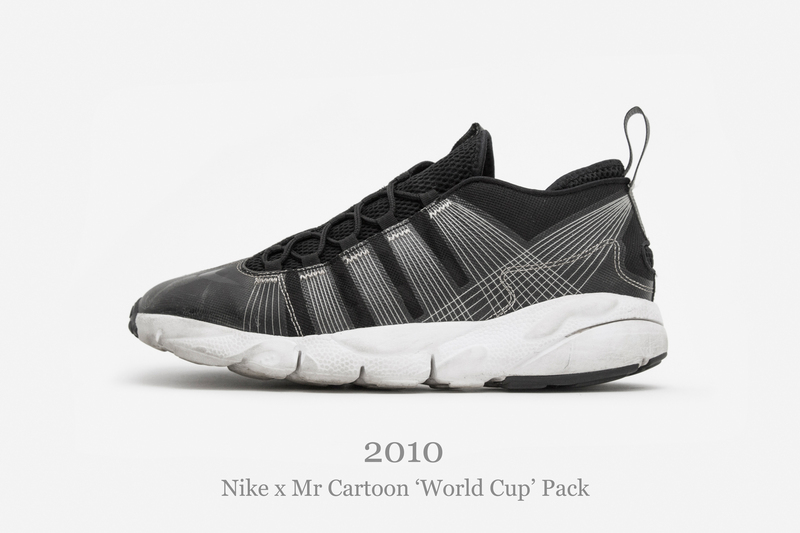 In another World Cup themed release, England and USA were the featured teams to work with a selected artist to create a series of shoes. Among the full collection, a Footscape Free Motion was chosen for English illustrator James Jarvis, and American tattoo artist Mr. Cartoon to work on. Well known for the monochrome theme that runs throughout his work on skin, he transferred his aesthetic onto the Footscape by incorporating script lettering onto the ‘Air’ branded pull tab, and adding an illustrated eagle drawn in his signature cholo style to the insole. Flywire technology utilised a series of cables situated across the upper to enhance strength and reduce weight, and could be found in some of Nike’s most groundbreaking basketball and running shoes since it’s introduction in 2008. When applied to the Footscape, Flywire acted in harmony with the lace loops to pull the upper together when laced and enhance the fit. This ACG inspired pack came in two colourways, each hinting at a life outdoors with rugged material alterations and speckled midsoles. A further evolution of the woven concept, the handmade Air Footscape Woven Chukka added an extra bit of height to it’s predecessors. With the addition of a ridged Free Motion midsole alongside it’s side lacing system and full wrap around weave, it’s certainly not a shoe for the faint hearted. Despite it’s ‘Frankenstein’ looking exterior, all these design elements made it an incredibly comfortable shoe. 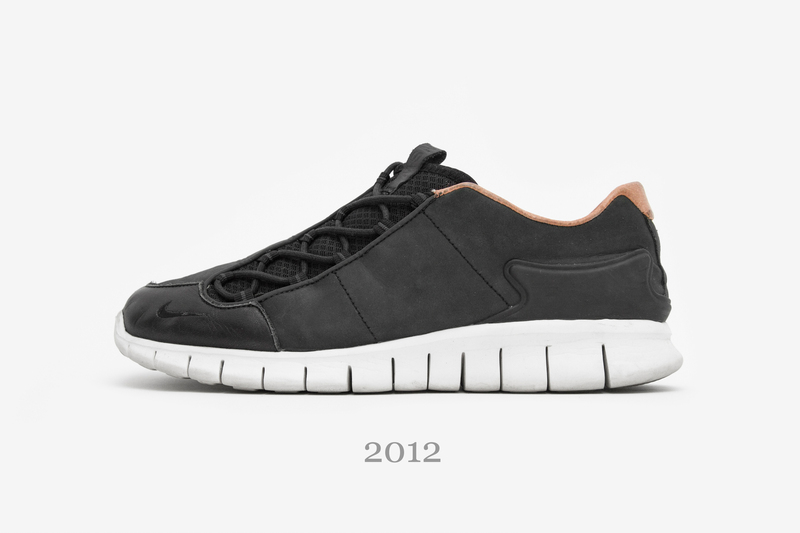 A throwback to 2008’s experimental play with Free technology, 2012 saw the release of the Free Run 2, the newest venture in midsole cushioning and latest development in Nike’s continued experimentation with splitting a midsole. The Footscape’s shape lent itself perfectly to the Free Run 2 tooling, and with an NSW makeover that included high quality nubuck uppers, a leather toe and tan leather sockliner and insole, the premium package was complete. A tribute of sorts to the original design foundation, the Footscape Motion pack of 2013 saw perforated ripstop uppers sit alongside the signature suede toe piece. With a 4 way pack of colourways, it was predominantly marketed as an asian only release, with a few pairs cropping up at european Nike outlets. A continued update of the midtop version, the Footscape Desert Chukka took 2006’s release and transformed it with a motion midsole and varying versions of weave on the upper. Above are two examples showing both a slightly smaller woven texture, and one that uses a combination of materials with stingray hits on the eyestay and heel counter. Releasing alongside the Lunar Fly 306 as part of the ‘Shanghai’ pack, Nike developed the woven concept further this time by incorporating a reflective thread throughout the constructed upper. A premium, hardwearing leather on the upper sat next to a vibrant green midsole, with an iridescent hit on the heel tab to finish off the look. 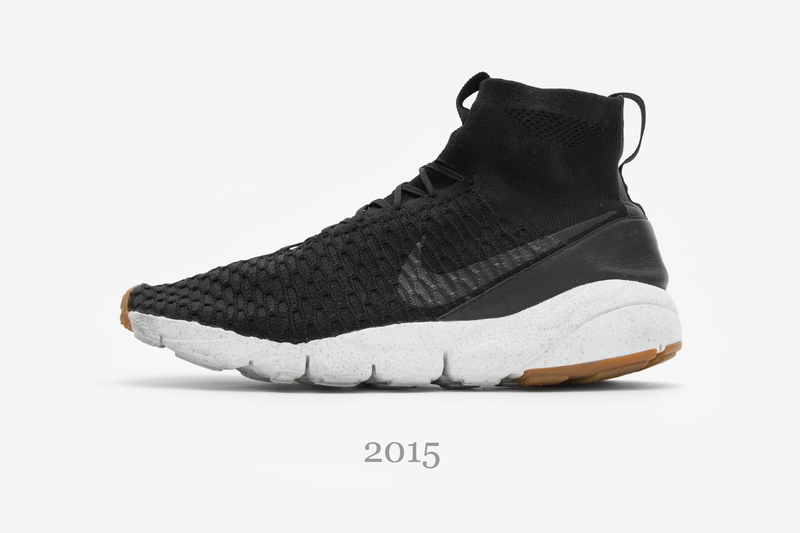 2015 presented us with the latest incarnation of the Footscape’s bloodline. In a move which saw Nike collide the worlds of football with running and lifestyle, we were given a selection of silhouettes which incorporated both categories beautifully. Alongside the Mercurial Superfly, the Footscape Magista utilised the sock-like upper of one of their flagship football boots of the moment, the Magista Obra, and fused it with the Motion tooling from the Footscape series. Kitted out in a full flyknit woven upper with leather panels on the rear, this gave the underrated Footscape a new lease of life, and brought it back into the limelight for a new level of consumer. 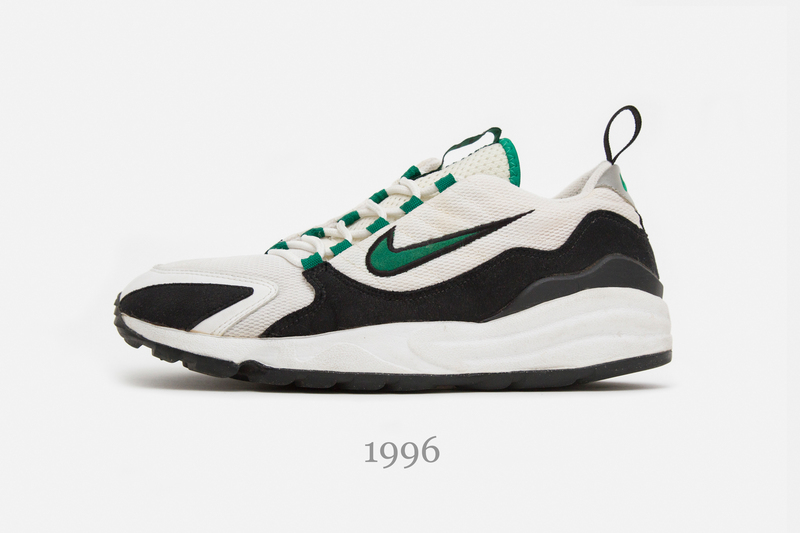 It’s interesting to note that the asymmetric system used on the Footscape inspired many a boot during the late 90’s, with the off kilter lacing helping to provide a smoother surface when striking the ball.